North Branch Township vies with Spencer Brook for having the earliest settlement in the county. By the time the county was established in 1857 there were already a number of settlers. Among them were J. P. Owens, the Huntleys, and the Henricks. It was on a farm owned by Owens that the Cornstalk War in 1857 was precipitated (see “Minnesota’s First White-Indian War Begins in Isanti County” in Isanti County, Minnesota-An Illustrated History by Bergstrom and McGriff. The township is named for the north branch of the Sunrise River that flows through it. It was officially organized in 1869. At one point a petition was presented to the County Board to have the township be named Congress but that name was rejected. A number of Germans settled in the southern part of the township in the Weber community. They were primarily from northern Germany, Posen, Pomerania or West Prussia. Among them were the Kruegers, Maaskes, Steinbrings, Splittstosers, Bahnemans and Pohls. The Spring Lake community was settled mostly by Swedish immigrants from the province of Småland. The Younquists, Charles Ericksons, Dahls and Samuelsons were some of the first settlers in that area. 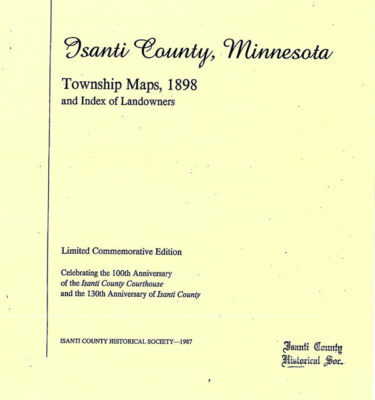 The historical comments regarding each township is taken from Minerva Hixson’s Yesterdays as well as from other documents and records at the Isanti County Historical Society.